The Rummy Nose Rasbora Sawbwa resplendens is endemic to the Shan State of eastern Myanmar (Burma), Asia. The only member of its genus, its size and habitat are just a few of its remarkable features. This very small fish reaches a total length of not quite an inch (2.5 cm), making it both one of the smallest cyprinids and one of the smallest known vertebrates. The Rummy Nose Rasbora is found in Inlé Lake, an isolated mountain lake located almost 3000 feet (900 m) above sea level. The lake is quite shallow, only about 7 to 10 feet (2 -3 m) deep, with naturally occurring floating "islands" around the margins These islands are thick mats of vegetation floating on the surface. They are made up of dense tangles of various plants, both living and dead, which provide shelter and food for these little cyprinids. This fish also occurs in the surrounding watershed of the lake. During the wet seasons, the lake rises to fill an outflowing seasonal stream known as the Balu Chaung. When this stream floods, it spills over into surrounding areas, often taking fish species with it. During the dry seasons, the waters recede, leaving isolated pools and ponds with separate populations of fish. This fish has no shortage of common names. Those referring to its place of origin include Sawbwa Barb, Asian Rummynose, Burmese Rummynose, and Burmese Rammy Nose. Of these, "Sawbwa Barb" is most interesting. The term Sawba means "king" in the Shan and Tai languages and is a term that was used as a royal title by rulers of the Shan States. This fish is also known as the Naked Microrasbora because the body is totally naked, or scaleless, and its adult size evolved via a process known as miniaturization, so it is considered a "micro" species. The terms "barb" and "rasbora" are both used due to an ongoing debate over whether this fish fits into the Barb, Rasbora, or Danio category, or if it belongs in its own group. This attractive, streamlined fish features completely different coloration between the sexes. The males have a “nose” and orange-red tail tips, and their body tends toward a rather milky-blue color. 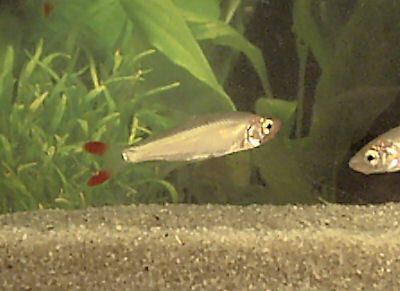 The females are a plainer silver to a light olive-brownish color with transparent fins. Being scaleless gives both sexes their even coloration. This fish has surprisingly similar markings to the South American Rummy Nose Tetra Hemigrammus bleheri, but the two species developed separately into transcontinental look-alikes. 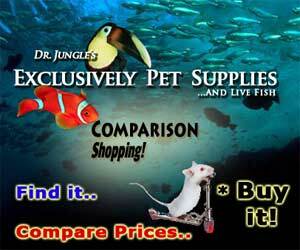 These are great fish for color and temperament but suggested for a more experienced aquarist. Though they are very particular about their water, they are otherwise hardy and easy enough to care for. The companionship of their own species is important for their well-being. They need to be kept in a groups of at least 8 or more individuals. Since they are so little, a school could be housed in an aquarium as small as 10 gallons, but a larger, 20-gallon tank is suggested. The larger size is easier to maintain and has room for plenty of decor. These peaceful fish can be kept in a community environment, but due to their small size, they are a bit nervous. They have a friendly demeanor with other fish and can be kept with tankmates that are of similar size and behaviors. However, these shoaling fish will develop a distinct pecking order within their own kind, and the dominant males can become quite cantankerous and combative. They do best with a sexually balanced school of about 4 females to each male and kept in a specimen tank. A planted decor can also help keep the peace by breaking up the males' line of sight. The Rummy Nose Rasbora Sawbwa resplendens was described by Annandale in 1918. Sawbwa is a monotypic genus, meaning it contains only this one member. They are endemic to the Shan State of eastern Myanmar (Burma) where they occur in a single lake, Inlé Lake, and the surrounding swamplands. Other common names they are known by include Sawbwa Barb, Asian Rummynose, Naked Microrasbora, Burmese Rummynose, and Burmese Rammy Nose. This species is listed on the IUCN Red List as Endangered (EN). The species has a restricted range, and its population has been in decline. Suggested threats are introduced species, pollution, possible over-harvesting for the aquarium trade, and the reduction of the area of open water due to recent draughts. Other fish species, including non-native and farmed fish, have also been introduced with some entering through raised water levels from a downstream dam. These introduced fish pose major threats, both as predators and competitors, and include farm-raised Parambassis spp. and tilapine fish. These cyprinids are found in Inlé Lake, which is located at almost 3000 feet (900 m) above sea level, as well as in the surrounding swamplands of the lake. The lake is quite shallow, only about 7 to 10 feet (2 -3 m) deep, with a rich loamy soil substrate. Along the margins of the lake are naturally occurring floating "islands." These are thick floating mats made up of dense tangles of various plants, both living and dead, which provide shelter and food for these fish. These fish congregate in small shoals in both the mid-water areas and the margins of the lake where there is dense, submerged vegetation. They live among tangled roots and plant stems at the base of the floating islands as well as in areas where there is grass and reed-like plant growth. The waters can be clear or peaty and are often foul. These fish feed mainly on small invertebrates, algae, and other zooplankton. This fish has a slender, streamlined body. It can reach a length of just under 1 inch (2.5 cm) and has a possible lifespan of 3 to 5 years with good care. The coloration completely differs between the sexes. The males have a “nose” and tail tips that are orange-red, and their body tends toward a rather milky-blue color. The females are a plainer silver to light olive-brownish color with transparent fins. Being scaleless gives both sexes an even coloration. Lifespan: 3 years - They can have lifespan of about 3 to 5 years with proper care. This fish is usually wild-caught or has only been in captivity for a few generations, so it has fairly specific water requirements and is very sensitive to pollutants. Because of their sensitivity to water conditions, they are generally not a good choice for a beginning aquarist. Otherwise, they are hardy and easy enough to care for. Newly imported specimens are often in poor condition and can be difficult to become acclimated in the aquarium. It can be difficult to get these fish to eat processed foods. They often will refuse anything but live foods. Aquarium Hardiness: Moderately Difficult - This fish has fairly specific water requirements and is very sensitive to water pollutants. The Rummy Nose Rasbora are omnivores. In the wild, they feed on small invertebrates, algae, and other zooplankton. In the aquarium, they require a healthy balance of foods. Since specimens are largely brought in from the wild or are just a few generations past that, some aquarists find it difficult to get them to accept prepared foods. However, prepared foods are really the only practical way to provide balanced nutrition, so fish should be weaned off of an exclusive diet of live foods. Offering small live foods at first is suggested, then introduce dry and frozen items as the fish becomes more settled. Offer meals of small live and frozen fare such as Daphnia and brine shrimp as supplements to regular aquarium foods to develop their best coloring. Live foods are also helpful to bring the fish into breeding condition. Rummy Nose Rasboras will do best when offered food several times a day, but only offer what they can eat in 3 minutes or less at each feeding. If you feed only once per day, provide what they can eat in about 5 minutes. Diet Type: Omnivore - It can be difficult to get them to accept processed foods, but it is important to provide balanced nutrition. These fish are sensitive to water conditions, and their water needs to be kept clean. At least 25 to 50% of the tank water should be replaced once a month. If the tank is densely stocked, 20 to 25% should be replaced weekly or every other week. The substrate should also be vacuumed during water changes to avoid accumulation of waste. The Rummy Nose Rasboras are a shoaling species that will inhabit all regions of the aquarium. Since they are so small, a school could be housed in an aquarium as small as 10 gallons, but they will do much better in a larger tank of 20 gallons or more. Water stability is much easier to maintain in a larger tank and plenty of decor will keep these fish comfortable and reduce aggression. As they are particular about their water, their tank does require a little extra care. These fish are not very accepting of different water parameters and should be introduced to a mature aquarium with an established biological filter. The heater and thermometer need to be dependable because these fish have a small range of tolerable temperatures. The tank should also be carefully covered as these fish are liable to jump if startled or excited. These fish will do best in a tank that is set up to mimic their natural habitat. The substrate can be a fine sand and somewhat silty, and the tank needs to have decor that will break the males' lines of sight to limit aggression between combative competitors. Densely plant around the edges with a good variety of plants and leave open areas for swimming. Some plantings of hardy, broad-leaved rosette plants, such as Anubias or Sword Plants, work well. The addition of some floating plants will help diffuse the light entering the tank. Drift wood and leaf litter should be avoided as they can release unnecessary tannins an other organic compounds. Minimum Tank Size: 20 gal (76 L) - A 20-gallon tank will allow for water stability and room for plenty of decor to keep these fish comfortable and reduce aggression. Water Region: All - These fish will inhabit all regions of the tank. This fish is an excellent candidate for a species tank. It needs a large school of 8 or more individuals to feel comfortable. Mixing the sexes makes the males flush darker. Keep in mind, however, that too many males in close quarters have a tendency to fight. Keep them in a ratio of 4 females to each male to help reduce the males' combative nature. These fish can be very shy, which is problematic for aquarists looking to display them at their best coloration. These are slightly nervous fish, so if you choose to mix species, take care that these little cyprinids aren’t scared into hiding. They are very peaceful with other species and generally won’t be a source of trouble in the community aquarium other than occasional squabbles between males. Temperament: Peaceful - They are peaceful with other fish, but quite timid and easily stressed. Among themselves, the males are combative. Same species - conspecifics: Yes - These fish need a school of at least 8 to 10 individuals. To reduce male aggression, keep them at a ratio of (4:1) 4 females to 1 male. Peaceful fish (): Safe - Only combine other active fish that are similarly sized and peaceful. Semi-Aggressive (): Threat - Because they are so small, they are easy targets for even mildly aggressive fish or fish that are bigger. The males have a red “nose,” red tips on their fins, and a light, milky-blue coloration. Females are usually smaller with a glassy, silver coloration. Breeding the Rummy Nose Rasbora can be a bit challenging. Like other cyprinids, they exhibit no parental care for the young, but they differ slightly in their spawning method. Rather than being open water egg scatterers, their eggs are deposited on aquatic vegetation or filamentous algae. The most favorable results are reported when they are kept as a group of adults. Conditioning well with live foods will bring out the males' color, and when well fed, mature females should begin filling out with eggs. The breeding tank should be densely planted with fine-leaved plants, such as Cabomba or Milfoil, or with artificial plants. A substrate of marbles will save any eggs that fall from the plants, or a spawning mop like the plastic ‘grass’-type matting works very well. Females seem to be only willing to breed at certain times. Temperatures in their native lake dip down to about 57 to 64° F (15 - 18°C) around that time, so this seems to encourage spawning. Some suggest that providing a period of cool temperatures in February helps, and that they will fail to spawn at temperatures in excess of 77° F (25° C). The general hardness of the water should be at least 20° dGH for both successful spawning and rearing of fry. Place a group of adults in the breeding tank. They may need to adjust to the tank for a week or so before anything happens. The dominant males may form temporary territories when spawning. Spawning will usually occur in the morning hours after a strong ritual display and then the parents will deposit eggs among plants. Cyprinids are continuous spawners, repeatedly depositing a few eggs at a time. The parents should be constantly well fed during spawning and then removed as they will eat the eggs and possibly the fry. When the fry hatch, they are extremely small and will survive in their yolk sac for about 24 hours and then be free-swimming. Feed the free-swimming fry starter foods like infusoria, rotifers, or other liquid fry food several times a day. In about 5 to 6 days, they will be large enough to eat crushed flake food or hatched brine shrimp. See Fish Food for Fry for information about types of foods for raising the young. The Rummy Nose Rasbora is fairly hardy, and disease not usually a problem in a well-maintained aquarium. Still, they get stressed very easily, which makes them prone to many common aquarium diseases. With any additions to the tank, such as new fish, plants, substrates, and decorations, there is a risk of introducing disease. Properly clean or quarantine anything that you want add to an established tank so as not to upset the balance. A good thing about this rasbora is that due to their resilience, an outbreak of disease can often be limited to just one or a few fishes if dealt with at an early stage. The more closely their environment resembles their natural habitat, the less stress the fish will have, making them healthier and happier. Stressed fish are more likely to acquire disease. For information about freshwater fish diseases and illnesses, see Aquarium Fish Diseases and Treatments. The Rummy Nose Rasbora has yet to really make it on the international fish market. They are available in a few cities but not everywhere, and are moderately expensive. Females tend to be more difficult to come by.